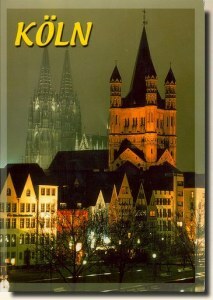 Cologne Cathedral is a Roman Catholic church in Cologne, Germany. It is the seat of the Archbishop of Cologne (currently Cardinal Joachim Meisner), and is under the administration of the archdiocese of Cologne. It is renowned as a monument of Christianity, of German Catholicism in particular, of Gothic architecture and of the continuing faith and perseverance of the people of the city in which it stands. It is dedicated to Saint Peter and the Blessed Virgin Mary. The cathedral is a World Heritage Site, one of the best-known architectural monuments in Germany, and Cologne's most famous landmark, described by UNESCO as an "exceptional work of human creative genius.